Happy September to you all! We’re back from a fantastic vacation in the Pacific Northwest, visiting wonderful friends and our dear son, Henry. I especially enjoyed the long drive up and back, along the California coast and through the redwood forests. It’s so beautiful and meditative to drive those roads… those parts of the trip feel like vacations in and of themselves. Today we have the first in a short series of new articles from Chuck about using copyrighted material that is not your own. Up to this point, we’ve presented concepts where the “dos” and “don’ts” of copyright law are pretty clear. These next few posts explore territory where definitive answers are more elusive. We get questions from artists about using a phrase from a song lyric, or a few words from a quotation, or scraps of gift wrap in a collage (just to name a few examples). These are good questions, from artists making original work who want to do the copyright thing. We hope these next few posts begin to shed some light. In prior posts we’ve looked at how to find copyright-free text for use in artworks. In this week’s installment we’re going to take a look at using text that’s still under copyright. Specifically, is it ever okay—without getting permission—to use copyright-protected text in an artwork? Before getting into the details, we want to emphasize that your best bet is to get a license agreement from the author. Any time you use text that is under copyright without first getting the author’s permission, there is a chance you could end up in a dispute. But in some cases there’s an argument that text you’d like to use is so commonplace it couldn’t possibly be copyright protected. And sometimes what you’d like to use is such a tiny piece of the other work you might wonder whether it would be okay. Other times, you might be inspired by a quotation and want to alter it a bit to better suit your message (as Betsy's done with today’s graphic*). First off, there’s a general rule that very small amounts of text can’t be copyrighted. As the U.S. Copyright Office advises, “The Copyright law does not protect names, titles, or short phrases or expressions. Even if a name, title, or short phrase is novel or distinctive or lends itself to a play on words, it cannot be protected by copyright.” This ban extends to “catchwords, catchphrases, mottoes, slogans, or short advertising expressions.” So if you’re keen on using the catchphrase “low hanging fruit,” have at it. This presumption against short-text copyright derives from the rule that ideas can’t be copyrighted. Because there is a limited number of ways to express an idea, the law does not want to shut off access to ideas by over-protecting particular phrases by which they’re conveyed. Similarly, common expressions, such as “the future is now,” (which was a 1950s movie title and later, in the 1970s, popularized by NFL coach George Allen as a call to be excellent today) are seen as part of our common language, i.e., the public domain. There are court cases, however, where a small amount of text was protected. The reason, again, comes in the distinction between ideas and expression. As we’ve noted before, copyright protects only the expression of ideas not the idea itself. Ordinary words and phrases (i.e., common expression) and forms of expression that flow necessarily from the idea, get less or no protection. But the more novel and creative the expression of an idea is, the more likely it will be protected. There’s a famous court case that offers two examples of brief text, taken from larger works, that would be protected. The first is “Euclid alone has looked on Beauty bare,” which appears in a fourteen-line poem by Edna St. Vincent Millay. The second is "Twas brillig and the slithy toves,” which is the first line of the poem “The Jabberwocky” in Lewis Carroll’s “Through the Looking Glass.” As to these, the court notes, even though quantitatively small in comparison to the work in which they appear, their novelty would give them protection against unlicensed use. From this you can conclude a kind of “inverse proportionality” rule. The more creative the text, the less you can take from the original. The less creative the text, the more you can use. Here the tee-shirt maker had appropriated the entire text of what Brilliant described as “pot shots,” one-off pithy statements which at the time (back in the 70s) he offered for sale on greeting cards. Here there was no issue as to whether the infringer took too much text, (they’d taken it all), but rather whether the text was sufficiently original to warrant protection. The court reasoned that Brilliant’s epigrammatic wit was sufficiently idiosyncratic and creative to be worthy of protection. This “creativity” analysis is, however, a tricky thing. John Lennon once faced a lawsuit claiming he’d improperly copied the words “Here come a flat-top, he was movin’ up with me,” which was just one line in the thirty-line Chuck Berry song “You Can’t Catch Me.” In “Come Together” Lennon changed the line to “Here come old flattop, he come groovin’ up slowly.” Even though he’d taken only a small part of Berry’s song, and modified the text, Lennon settled the matter without trial. But it can go the other way. In another song writing infringement action the court found that the lyric “Got my mojo working, but it just won't work on you,” was a common phrase lacking sufficient creativity and qualitative importance to be protected. So if there’s any “take away” here, it’s that commonplace language and popular phrases might be okay to use even if they appear in a copyright protected works because the author can’t lay claim to copyright in such small arrangement of words. Practically speaking, if you want to use a quote, find its actual source, e.g., the book or speech or movie it first appeared in. How much of the original work are you intending to use? If it’s just a tiny fragment in a 300 page novel, better. But even if you’re just taking a tiny fragment, ask whether this is ordinary language or highly creative? Is it more like “I get up every morning to the alarm clock’s warning,” or “'In Xanadu did Kubla Kahn a stately pleasure dome decree”? The more it looks like the latter, the more you’re going to need to think about a license. 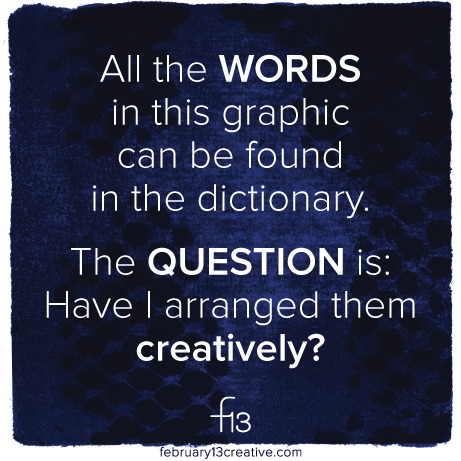 All the words I use in this graphic can be found in the dictionary—it’s just a matter of arranging them creatively. That was my original idea, but it felt too derivative to me. Given what Chuck explained in today’s post, I’m curious to know what you think about my use of Maugham’s words. Please remember: The information provided on this blog and throughout our website is intended for general educational purposes only. While some information on this site relates to the law as a topic, it's not intended as a substitute for legal advice. Only a lawyer, selected by you and fully informed of the facts relating to your particular situation, can render legal advice. small claims copyright court can be a reality! can I keep my copyright while letting others use parts of it? what do I gain by registering my copyright? are copyright laws really such a good thing?